Tired of the same old, same old? Super-size it and make the "same old" a brand new experience loaded with SUPER SIZED learning! With a little imagination and cleverness, you can super-size almost any learning opportunity you currently provide young children. WHY would you want to SUPER SIZE learning? What happens naturally when children are presented with something SUPER SIZED? 3) They need to use more muscles. 4) They need to coordinate their bodies. 5) They need to collaborate with others. 6) They need to strategize. That's just a few of the benefits super sizing play (aka: learning) provides! This blog has some of the successful ways I have super-sized play and thus, the learning that goes along with it. Feel free to use these ideas, then put on your own thinking caps and clever pants and see what normal, everyday play opportunities you can supersize for super sized learning in your programs!! All you need is a large, sturdy box (this is a treadmill box and it's HEAVY), large paper, paint and a variety of balls to supersize the typical marble painting! Look at the focus, the teamwork, the muscles and coordination!! This picture is at the beginning of the process, where the children are using trial and error to figure out how this is going to work. Further into the process, they have learned that standing up helps with lifting the very heavy box. They have also named themselves "Parkers Side" and "Ty's Side" in order to coordinate the movement of the balls. Through the process of trial and error and cause and effect, it was discovered that the box could be tilted this direction too. It was also determined that we needed more paint (FIrst determining, then asking for what you need is a valuable life-long skill). Make at least 3 batches of homemade playdough..step back and watch out for super-sized learning!! I have used anywhere from 3-8 batches at a time! Plop the playdough onto the center of the table in ONE LARGE MOUND. Stand back, and let the children take the lead from here! For extra fun, hide special items inside the playdough! Our favorites? "Monster Playdough" (only, I never told them it was monster playdough..they took what they found and created monsters out of it!!) "Treasure Playdough" (jewels and necklaces) and "Creepy Crawly Playdough" (plastic and rubber bugs!!) and "Snowman playdough" (buttons, small wooden dowel pieces painted orange). It takes more then just fingers to manipulate a large mound of playdough. Lindsey has found it necessary to use her entire arm in order to create enough pressure to smash the playdough down! Have you ever seen a child manipulate a small batch of playdough with both of their ARMS?! I don't think so! Little Trillian is feeling mighty fine about himself as he cuts through this massive, and challenging mound of playdough! Look at him working those all-important gripping muscles!! This super sized mound of playdough has pirate treasure hidden inside. 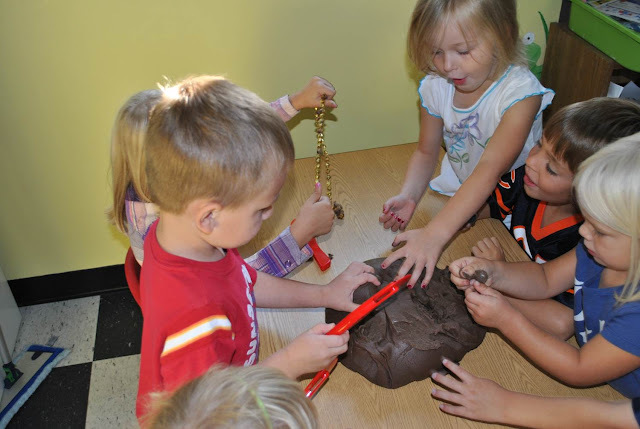 Super-sizing playdough gives the children the opportunity to share, cooperate, imagine, compromise, use more muscles in different ways and is just plain FUN!! Floor tiles found at Sam's Club make an AWESOME super-sized puzzle! Plop these gems into the environment and let the children make and therefore OWN the discoveries!! The fact that the puzzle piece is BIGGER then Erik is and HE IS STRONG ENOUGH TO HOLD IT!! This is extremely empowering for a young child. Little fingers have to work harder to manipulate large pieces. Determination and persistance are big players when the going gets tough! It didn't take long before an older child came to the rescue to assist this younger child with properly connecting the puzzle pieces. Older children filling the role as leader and helper is very empowering for them. As if staying on the path, safe from hot lava wasn't difficult enough...then the children added SNAKES to the challenge! Read more about how this super-sized play evolved at my blog, www.playcountsdenitadinger.blogspot.com . You will find it under the category, "ramps". Think outside the box for some SUPER SIZED ramp fun! When the children were telling me what they knew about ramps, one said "Hey! My nose is a ramp, Nita!". Another child quickly added to that by holding onto her long hair declaring it was a ramp too! This made me think outside the box for some super fun, super-sized indoor ramp fun!! Read more about this, and see more pics by clicking HERE. The children, on their own started recycling the water...quickly catching it at the bottom of the ramp and returning it to the giant tub of water. The balls got tossed in for fun as they watched them travel down the ramp. They learned the balls traveled faster with water poured after them. These PERFECT cardboard ramps were discovered during a dumpster diving expedition to our local appliance store, and yes, that is the treadmill box once again! Add some bowls of paint and ramps and you have a great opportunity for super sized learning! The children loved to adjust the ramps to get the results they wanted. Ella and Ty are debating the angle of the ramp. Ella wanted her ball to make a bouncing trail, while Ty wanted his to run smoothly across the paper. If it's fun in smaller quantities...then it's over the top GRAND when you super-size it!! Take goop for example! This simple cornstarch and water mixture is a hit...especially when feet can get involved too! A simple dip in water cleans it right off! Yes please! Plenty of goop and space for free exploration! I love to observe children organizing themselves. I had nothing to do with this line. Look at them patiently waiting their turn! They are motivated by the fun and the fact that they own this adventure....and their feet LOVE it! Notice the purple bucket? That is the default washing bucket. It is present whenever something is messy. This gives sensitive children a safety net knowing that the ick can be erased immediately. No explanation needed. Clearly, she is LOVING the opportunity to be IN goop! Super sized play provides super sized sensory experiences that awaken the senses and gets brains thinking of endless possibilities! There you have it...a small list to get the juices flowing. Now,...go put on your thinking caps and creative pants and see what fun play opportunities you can SUPER SIZE for SUPER SIZE LEARNING!! You have all heard me refer to plopping in pretty much all of my posts. I cannot tell you how this method of "following" children has changed my program for the better. The children are learning valuable, life-long skills and also amazing me with their cleverness, organizational skills and their willingness to learn through failures (which I believe to be over -the-top important). In a nut shell...they are so excited to TRY their ideas out, and as they fail, they make changes that either leads to success, or the realization that their plan didn't work, so lets try something else! A plop, by my own, self-made definition is (insert vision of me putting on instant, IQ-boosting spectacles and clearing my throat): an object, book, story, song or mystery word that is quietly placed (aka: plopped) into a child's environment while sharing no (zip, zero, none, notta) pre-conceived adult ideas in order to give ownership of discovery to children. The "plopper" is prepared for what could POSSIBLY happen...but is willing to drop those ideas in order to follow the usually BETTER possibilities a child's mind imagines! In other words....set something out...either in the wide open, or hide it amongst the environment and wait for the children to discover it. However you choose to plop your plop....just plop it...set it out there. Then, step back ready to observe, gather materials upon request (I insist my crew ASKS FOR WHAT THEY NEED...so, if they need more materials, all they have to do is ask) If it is a story, share it with the children and let it motivate their play...enhance it with a song or other plops that might go along with it. On this particular HOT day, as we were heading outside, I was thinking what can we do today. I move all of my messy, busy hands supplies out to my garage for easy access in the summer months, so I took one look at my shelf and started to grab. I simply grabbed foam beads and plastic lacing. I purposely cut the plastic lacing too short to be necklaces and too long to be bracelets. I did this just so their creative minds would have to take this "regular" activity in an entirely new direction. When you use the plopping method, you don't say a word. You simply plop down the materials and quietly observe. Instantly the bucket was surrounded by eager fingers. The children's observations were so accurate as I overheard "HEY....these beads can float!" "Brrr....the water is cold" Then the plastic lacing was being compared "Mine is longer" "No, look, mine is longer" So already, look at the learning. It did not take long for them to realize that these were not going to be necklaces or bracelets. So then...what should they be? Let the water snake rides begin!! Gavin, who is a dragon fanatic (check out this blog to learn why he is dragon nuts, and why there are always dragons to be found at my house) decided he wanted his dragon to take a ride with his watersnake. (now, you and I both know this is not going to be possible...BUT the point of plopping is to let children make discoveries....so I said nothing, just photographed and observed. The photo below shows his first attempt. He is so excited about his "wonder if..."
Of course the dragon just sat there...and did not move at all. The water snake did not move either. After the fifth or sixth attempt, Gavin gathered the information he had just learned and proudly shared it with everyone: "HEY GUYS! The dragons dont float!" Notice the angle Alayna is holding the hose in the photo below? That is intentional. She has learned through trial and error, that the water snakes go the fastest if the water hits them just so. This is her very own discovery, and it gave her much pride to share that new knowledge with everyone. The photo below shows Jack taking extra care as he places his watersnake into the gutter. He has learned that if he puts the snake in upside down (the knot last, instead of first) his snake comes apart by the end of the 10ft. gutter. Again, a discovery he owns and a deduction all of them made. Patience and consideration for others are very important, life-long skills. I have learned that when it is a child-led occurance, patience comes much easier for young children. I have been amazed at how long they can patiently wait for their turn, when it is their decision. A simple plop: foam beads, plastic lace and water presented quietly with no preconcieved notion, just presented with the freedom to explore them. I took the backseat to see what kind of adventure would ensue. The children added to the plop as they saw fit, and the rest is history! Those three SIMPLE materials created a morning (and several more) filled with boundless trial and error, scientific process, small motor development, creativity, imagination, cause and effect, patience, cooperation, collaboration, sharing and discoveries! The best part? If you ask the children what they did....they will tell you "OH..we just PLAYED!!"